Efficiency – when the air filter is clogged with dust and dirt, air flow is restricted. This, in turn, makes your unit work harder to achieve the temperature you want. When your unit works harder, it uses more power, and more power means you spend more money to keep it running. Unhealthy Air – if the air filter is clogged, it can’t properly filter the air going through your air conditioning system. As such, dust and particles will blow right through your entire system. This can be especially problematic for those with allergies. Hot and Cold Spots – also a result of restricted air flow, your property may have hot and cold spots throughout, making the temperature uneven and potentially uncomfortable. Overheating of Equipment – when your unit has to work harder to achieve the desired indoor temperature, your blower motor is working overtime. Eventually this may lead to overheating and potential total system failure. Frozen Coils – your unit has evaporator coils that need to get the full return of heat in order to work properly. When the air flow of your AC is restricted due to a dirty air filter, the heat is not properly transferred, causing the coils to freeze up. This will cause your unit to shut down. Remove old filter – most filters are on the right side of the unit, placed vertically into a slot. Pull the old filter out. NOTE: if your filters are in the vents, call a professional from Quality Air Heating and Air Conditioning to help you. Maintenance on your air conditioning system is essential for its successful operation. While there are some small things property owners may be able to do themselves, we don’t recommend “cowboying” it. 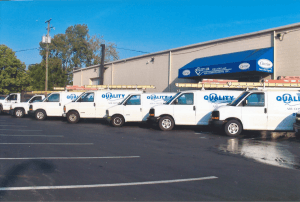 Contact Quality Air Heating and Air Conditioning for air conditioning repair in Columbus, OH. Give us a call today!